Launched in June, the 85.1m Solandge (formerly Project Niki) has left Lürssen’s Rendsburg yard yesterday to head to Stavanger in Norway. Solandge is designed by Espen Oeino. Built in steel and aluminium, she has a beam of 13.8m. New to the world's charter fleet, she can accommodate 12 guests in eight cabins with a dedicated deck for the owner. Her crew is composed of 29 crew members in 15 cabins. The contemporary interior, designed by Aileen Rodriguez, has classical touches and a mix a rare materials including 49 stone selections and 33 exotic woods. During her sea trials, she reached a top speed of 18 knots and a cruising speed of 12 knots, and she has a range of 6,000 nautical miles at that speed. Superyacht Solandge is under the management of Master Yachts. 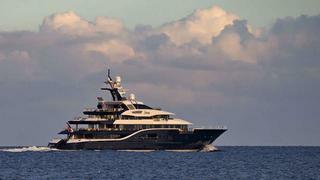 Now delivered, she enters at the 60th place of our Top 200 largest yachts list.